With the cold, often drizzling days, visiting Dublin, Ireland in the winter may sound like a drab time. But there’s still plenty to do and see even if the weather isn’t all sunshine and rainbows! My family spent Christmas in Rome a few years ago and it seemed like a great excuse to have a long layover in Ireland on our return trip. A friend of mine was currently living in Dublin, so we made a reunion trip out of it, inviting a few other friends from our high school days. Not only did we celebrate New Years, but we celebrated my engagement! My husband proposed while we were in Rome, the day before Christmas Eve. All in all it was a wonderful trip. Although, there is plenty to do and see in Dublin despite the possibly gloomy and definitely chilly weather, your plans may have to be altered if the weather does not cooperate. We were planning to see the Cliffs of Moher, but the winds were so strong it was closed (or at least was advised for people not to visit). That was disappointing. But, we loved Ireland so much we plan to go back, in the spring, and see the cliffs! Also, if you’re visiting over the holidays, certain sights may be closed, such as the Book of Kells Exhibit at Trinity College. Remember to check closures and plan accordingly! Here’s a list of everything we saw and did while visiting Dublin in December. We took several day trips outside of the City to try and squeeze in as much of Ireland as we could in a short time span. The Park was designated as a historical park in 1986. There are 15 commemorative statues throughout the park. One of the “Statues” is the The Fusiliers’ Arch, dedicated to the men of the Royal Dublin Fusilier’s who lost their lives in the Boer War in South Africa. The statue in the center of the garden, a bust in bronze, is of Countess Markiewicz who took part in the Easter Rising in 1916 and the first woman to hold a cabinet position. Also in the park, are playgrounds, a garden for the blind (contains aromatic plants), and a lake and a bandstand. Park’s Location. Getting to the park is easy if you’re staying near the Luas Lightrail, because there is a stop outside of the park. The main entrance is through the Fusiliers’ Arch, at the top of Grafton Street. The centrally located park is open from 7:30 AM until dusk, or 9:30 AM until dusk on Sundays. If you’re visiting in the winter, you’ll need to plan on visiting the park early in the day, before 4:00 PM. 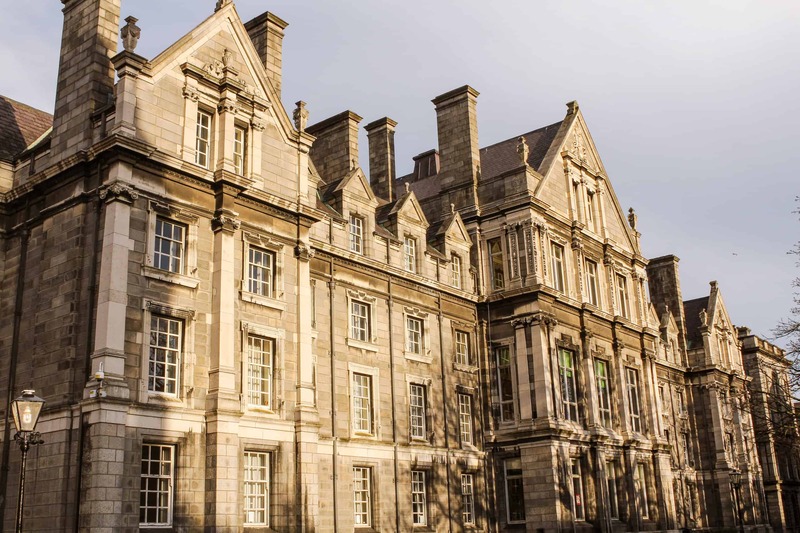 Trinity College of Dublin was created in 1592 by a royal charter. Dublin was in its early stages of functioning as a capital city. The institution has survived centuries of instability as well as more prosperous times. Walking around the campus is like stepping back in time. Many of the buildings date back to the 19th century and are inspired by universities such as Oxford. When we visited the college in December 2015, we simply walked onto the campus and roamed around. Most of the campus was closed for the holiday. I believe this is still an option, but guided tours are available through Authenticity Tours. To find out more about a guided tour, click here. The Tour begins at the Front Gate off of Dame Street. College Location. One of the highlights of visiting Trinity College is viewing the Book of Kells. The book is a 9th century manuscript with colorful depictions of the 4 Gospels. The Book of Kells is located in the Library and are on display 7 days a week (with the exception of Holidays, as I discovered over New Years). Tickets cost between €11 and €14 a person. If you’re interested in seeing the Book of Kells, click here for more information. To purchase tickets, click here. You may think that going on a tour of the Guinness Storehouse is cliche and a tourist trap, but it’s actually worth it! Besides, when in Dublin, right? We really enjoyed our time at the Storehouse and found the history, exhibits, and view from the bar very interesting and enjoyable. If we had eaten ahead of time we probably would have stayed longer (there is food available, but we wanted to eat in the city instead). I’d plan a few hours, from arrival to leaving, for your tour. There’s a slight wait after you arrive and you follow a group for the first portion of the tour. Then you’re free to roam and enjoy yourself! The best part about this tour, and why it stands out from most brewery tours, is it is interactive and visually stunning. There is a water display, lit up by changing colors, to help you imagine how much water is used in making Guinness every year. (If you’re trying to save water, drink wine not beer). The World of Advertising Exhibit has huge recreations of characters used in Guinness’s advertisements over the years, perfect for photo ops, and panoramic videos of commercials. Once again, Dublin offers you a chance to travel through time as you learn about the origins of the Guinness family and brand. In addition to photo opportunities, you can sign up to pour your own Guinness! Known as The Guinness Academy, this part of the tour (completely optional) teaches you how to pour the perfect Guinness, including the 90 second wait for the beer to settle to its famed dark color. A handful of people learn at once, taking turns pouring and having their photos taken in the process, and the beers are compared (some are better at filling to the brim than others–I think I did pretty well). You take a “class photo” at the end and you can sign up for the photo to be emailed to you. Either way, a Guinness is included in the tour. You have the option to pour your own or have one poured for you at the Bar. Once you’re done, head up to the Gravity Bar for a 360° view of Dublin as you drink your beer. Note: you may need to wait a while for a seat by a window. Location of Storehouse. If you take the Luas Lightrail, you’ll get off at the James’s stop. To purchase tickets (€18 a person), click here. Tip: go early in the day to avoid crowds. By noon, the Gravity Bar was packed. If you find yourself not knowing what to do or where to go, walk over to the Temple Bar District along the south bank of the River Liffey. The area near the Ha’penny and Millennium Bridges hosts several bars, restaurants, cafés, and art galleries. One café I recommend at the end of this post, Queen of Tarts, is located in the Temple Bar District. Within Temple Bar District is the Meeting House Square. This block is where you’ll find the National Photographic Archive, Gallery of Photography, Irish Film Institute and Olympia Theatre. You’ll find several murals and graffiti art on the side of buildings in this part of Dublin, too. For an easy day trip, travel on the DART train from Dublin to the beautiful coastal town, Howth! Leave from Connolly Station and arrive at Howth within 30 minutes. To look up train tickets and information, click here. We purchased a day ticket on DART and made sure to leave Howth in time to take the last train back to Dublin. Howth is the perfect town for meandering and taking in scenery. As soon as you leave the train station, the harbour is a few steps away. There are restaurants and cafes lining the main street in from of the docks if you’re feeling peckish. We ate in Dublin so we went straight for the Howth Lighthouse, stopping plenty of times for me to take pictures of the amazing reflection of boats on the water. The red lighthouse was established in 1818 and became electric in 1955. For more information on the lighthouse, click here. You can walk walk along the pier all the way to the lighthouse, giving you plenty of time to soak in the beauty of water and the Ireland’s Eye, an island off in the distance. If you’re lucky and are visiting on a nice weather day, you can take a ferry to the island (here’s a ferry I found online: Ireland’s Eye Ferries) – If you go, let me know your experience in the comments! Another option for those with nice weather or more time, is to hike along the cliff’s edge for a scenic view. For information on hiking the Cliff Path Loop, click here. We only had time for one trek, and we chose to see the other lighthouse. We couldn’t figure out how to visit the grounds of the Abbey, so we only saw it from a distance. The photo above was taken from Abbey Street on our hike to the Baily Lighthouse. We figured if the entrance was to be anywhere, it’d be on Abbey Street. But Howth tricked us. The entrance is off of Church Street! So close. You can reach Church Street from Abbey Street (it’d be on your left). If you reach the Parish, you’ve gone to far. OR, after leaving the train station, walk down Harbour Road for a short distance before you reach Church Street on your right. We didn’t see the castle on our trip. We left a little too late in the day to squeeze it in before our train. But if you’re trying to see as many castles as possible on your trip, check it out! The castle is located down a road branching off of Howth Road. It’s in the opposite direction of the town, so if you’re heading towards the harbour, turn around. For information on visiting the Castle, click here. Directions: From the Harbour follow Abbey Street until it turns into Main Street. Continue down Main Street, until you reached a trail located off of Balglass Road. We saw several people walking, riding bikes, or walking their dogs, so the path should be easy to find. Follow the path until it ends at Balkill Road and the Summit Inn (a great place to stop for a pint or to warm up. Or Both!) You can either take Bailey Green Road and walk close to the cliffs or follow Thornanby Road until the path veers towards the lighthouse. If you don’t have time to hike, you can always hop on a bus and exit at Howth Summit, then follow down Thornanby or Bailey Green Road. When we were finished, we caught a bus at the stop on Carrickback Road. The photos below are from our hike along the cliffs towards Baily Lighthouse. We wouldn’t walk up to the lighthouse, though. But this side of the peninsula is so difference from the harbour, that I’m glad we made the hike, especially since we missed out on see the Cliffs of Moher. This was my chance to see quintessential Irish landscape. We only ate/drank at two locations while we were in Howth. I added Abbey Tavern to this list because that’s where we planned on eating dinner but it was too crowded (there was a fútbol game on). Abbey Tavern – grab lunch or dinner here, located behind St. Mary’s Abbey. Check out their website, here. Harbor Bar Howth – grab lunch or dinner here! You can also watch a fútbol game or whatever other sport is playing. The Summit Inn – half way through your trek to Baily Lighthouse, stop in here for a beer. Check out their website, here. Only a 30 minute drive from Dublin, this beautiful castle and accompanying gardens is a great day trip option. The cold, gloomy weather on the day we visited gave the castle an eerie feeling as though it was haunted, especially when the winds howled past the glass windows. The wind was so strong, I nearly blew away as I struggled to walk to our tour! Set on 260 acres, the Malahide Castle is one of the oldest in Ireland, dating back to 1175, and owned by the Talbot Family. The tour begins with the oldest portion of the castle, a small, dark room covered with exquisite wood detailing. During the 1600’s, the family enlarged the castle, adding the towers. On the tour, you’ll learn about the family, wars, customs, and ghosts. The couch in the corner of the photo below is a courting seat – the lovebirds would sit in the middle with their chaperons seated on the ends (thank goodness those days are over). I highly suggest a guided tour so you learn not only about the history of Malahide, but of all Irish castles. Many castles were destroyed over centuries during times of turmoil by the Irish as the castles were seen as symbols of foreign occupation. Malahide survived almost unscathed. The Castle opens for guided tours at 9:30 AM and the last tour depends on the time of year. In winter, the last tour is at 3:30 PM. You can purchase tickets online or in person (We were able to buy tickets on site since there weren’t many people in December). Cost per person is €13. For more information, visit the Castle’s website, here (a video will start playing on the site). If roaming around ruins is on your bucket list, check out the Rock of Dunamase. The remnants of the castle sit atop a hill, providing visitors beautiful views of the countryside. If you visit during winter, near dusk, the grounds are especially creepy and dreary. The castle, dating back to the time of the Norman invasion, was destroyed during the Cromwellian Invasion of 1650. In its grander days, it belonged to Strongbow (Richard fitzGilbert de Clare) which ultimately led King Henry II to make his claim in Ireland. I felt like Claire in Outlander, wondering what each room might have been and what it was like to live or fight within its walls. The castle ruins are located less than 2 hours outside of Dublin. We stopped here after visiting Trim Castle (also about 1 1/2 hour drive or 88 km). Find out more about the castle here and here. Located in Meath County, Ireland, this castle should be on any movie buff’s list. Plus, it’s only an hour drive from Dublin, making it an easy day trip Castle. Two of my friends’ flights from the U.S. were delayed due to weather on the East Coast, so our plans had to change to accommodate their new arrivals. We ended up going to Trim Castle when it was closed. We could still walk around the grounds and take pictures, but we couldn’t take a tour inside. On the upside, no one else was around. There is a small amount of parking at the castle’s location. Since we visited the castle on a day when it was closed, we had no problems finding parking. But it most likely won’t be difficult to find parking in the winter time on a day when it is open. After exploring the Castle, grab a pint and warm up at McCormack’s Pub, located across from Trim Castle on Castle Road. We also stopped for a quick bite to eat at Rachel’s Coffee and Deli around the corner of Castle and Market Street. There are several restaurants and bars located on Watergate street as well. Be sure to follow Castle Street and cross Ireland’s Oldest Bridge over the River Boyne, too. The following list, in no particular order, are all of the restaurants, cafés, and bars we visited during our stay in Ireland. The Bernard Shaw – (location) a pub and cafe with a large outdoor patio for events, eating, and more according to their website. We spent New Year’s Eve here so I only saw it as a drinking venue. Have you been to Dublin? What were your favorite spots? What day trips did you take? Share in the comments below!